Volume discounts will automatically be applied to a product when it is manually added to a sales or purchase order with the volume discounted quantity. You will be notified that the discount will be applied. 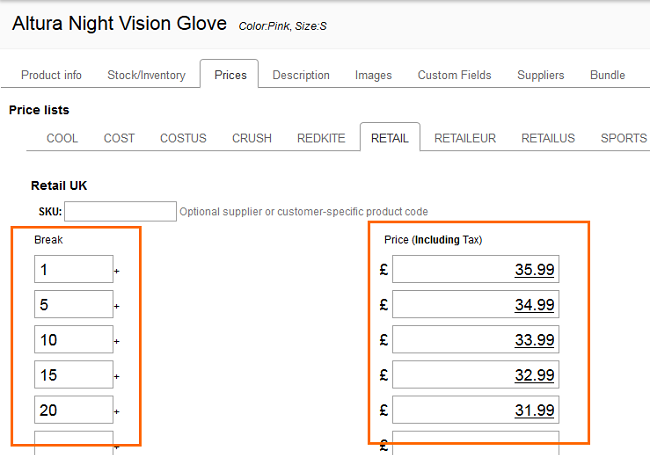 A volume discount is created by saving price breaks and the discounted price per item, on to the product record. Volume discounted prices (price breaks) can be imported using the price list import, but not using the product import. When creating your price list import file, enter breaks into one column separated by semi-colons and the price associated with each break is entered in the next column, separated by semi-colons.